Danger…well, let me tell you the story first. It started with a fairly innocuous act: Reaching for the celery. The next thing I knew, I was dodging the shrapnel from an exploding magnet. You see, when I tried to close the door it was stuck. On what, I wondered? No drawers open, nothing blocking the hinges. So I gave it a little tug and CRACK! I blew apart a magnet. Actually blew it apart. My best guess is that someone (who will probably never be identified) placed a rather strong magnet on the edge of the door. 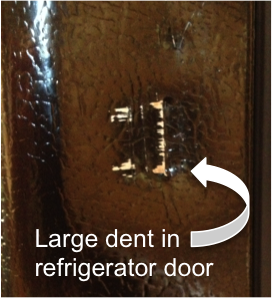 When I opened the door, it attached itself to the wall of the refrigerator and held on for dear life. And when I tugged the door shut I think I created nuclear fission. Danger: Magnets may be extremely unstable. Use caution when affixing children’s artwork, schedules or school lunch menus to the refrigerator. Or should the warning come with the magnet? I’m not thinking clearly. It’s possible I’ve had my poles reversed.